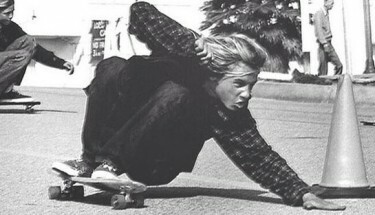 Called “The Chosen One” by his peers, Jay Adams was a member of the legendary Zephyr Competition Team – better known as Z-Boys, a group of skateboarders in the mid-1970s from Santa Monica and Venice, California. Adams had an outlaw image and brought a radical style shift to a sport that was at the time associated with roller skating. Taking his skateboard down steep hills and up the walls of an empty swimming pool — and, finally, over the walls’ edges — Adams helped pioneer the aerial style of skateboarding. His ground-hugging moves were unique, inspired by an extensive surfing background. At the 1975 Ocean Festival competition in Del Mar, California, Adams and and teammate Tony Akva skated with a revolutionary, aggressive style, taking third and fourth place in the freestyle category, but essentially changing the dynamics of skateboarding overnight. The Zephyr team disbanded shortly after the Del Mar event and half the team followed Kent Sherwood, who made the Zephyr boards, to a new team. Sherwood and Adams created the brand and team EZ RYDER, which changed its name to Z-Flex six months later. Adams was the brand’s star. Following a relatively short skate career, Adams struggled with drug addiction for many years and spent time in prison. He remained drug-free from 2005 until his death from a heart attack in 2014. He was 53 years old.